“Breasts feed us, nurture us and excite us. But the most versatile organ in the female body can also kill us”.1 “For such an enormously popular feature of the human race, it’s remarkable how little we know about their basic biology”.2 Although some of the above comments were made in relation to potential pollutants in breast milk, when you think about the same quotes from the insurance perspective, they are also relevant, as we know very little about the different patterns of breast cancer across the globe. This article will highlight the pattern of breast cancer in Asia. Over the past few decades, Asia has seen rapid economic growth, resulting in increasing life expectancy, declining mortality from communicable diseases and westernization of lifestyle. 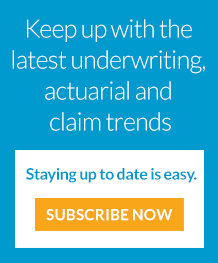 While these developments are overall beneficial, they come with a price. Breast cancer incidence is rapidly increasing in Asian populations. It was estimated that almost 1.7 million cases of female breast cancer were diagnosed worldwide during 2012, corresponding to a rate of 43 per 100,000. Close to a quarter (24%) of all breast cancers were diagnosed within the Asia-Pacific region (approximately 404,000 cases at a rate of 30 per 100,000), with the greatest number of those occurring in China (46%), Japan (14%) and Indonesia (12%). Australia (86 per 100,000) and New Zealand (85 per 100,000) also had much higher incidence rates than any of the other major countries in the region. The highest incidence of breast cancer for East Asia occurred in Japan and South Korea (both 52 per 100,000); for Southeast Asia the highest rate was in Singapore (65 per 100,000). Overall, significant increases in breast cancer incidence in recent years were observed in several Asian countries with incidence rates increasing by 3% to 4% per year in China (Shanghai), Singapore and Thailand. The largest rise was reported in Japan, where significant increases from 1980 onwards culminated in an average increase of 6% per year between 1999 and 2008.8 A different pattern was seen for both Australia and New Zealand (similar to U.S./Europe), where incidence rates increased until the mid to late-1990s, but have since stabilized. There are several cultural and economic obstacles involved in screening for breast cancer in parts of the Asia-Pacific region, including misunderstanding about the disease (such as the incorrect idea that surgery will cause cancer cells to spread more quickly), geographical isolation, lack of education and awareness, inadequate diagnostic equipment and treatment facilities, competing healthcare needs and a reliance on traditional remedies. The effectiveness of mammography screening among Asian women is unproven. Studies show that countries with the most dramatic recent increase in breast cancer screening rates are the ones that have also seen the highest increase in incidence, and this may not be coincidence. Taken together, these factors indicate that mammographic screening needs to be adopted prudently in Asian countries with customization for each region. 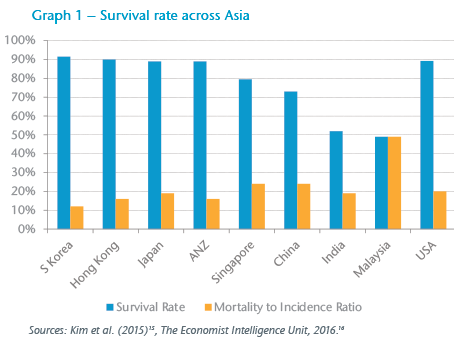 Survival Rates and Mortality to Incidence Ratio (MI Ratio) for countries with developed healthcare systems in Asia are comparable to the West, while emerging markets are lagging behind (see Graph 1). Much of the actual variation in breast cancer survival between countries is likely to be caused by disparities in early detection programmes and access to appropriate treatment services. In particular, the extent of breast cancer screening using mammography is instrumental in determining the proportion of early stage tumours, which in turn has an impact on survival. Educational and cultural barriers also exist for women in less developed countries, which often lead to late presentation, such as a lack of awareness of breast cancer, an incorrect belief that the disease is incurable or contagious, the stigma of having a mastectomy, and fear of rejection by their partner or community. It has been predicted that the international incidence of female breast cancer will reach approximately 3.2 million new cases per year by 2050. Aside from population growth, breast cancer incidence rates are expected to further increase within many less developed countries due to longer life expectancy coupled with the adoption of a more “westernized” lifestyle and increased population-based screening. As a consequence, the worldwide breast cancer burden is likely to be heavily influenced by changes to incidence in the Asia region. On a more positive note, the gains achieved in the treatment of breast cancer over the previous 20 to 30 years appear set to continue, led by the prospect of better tailoring of therapies to individual patients through molecular profiling and target therapies. This trend will result in improvement of breast cancer survival rates in Asia. 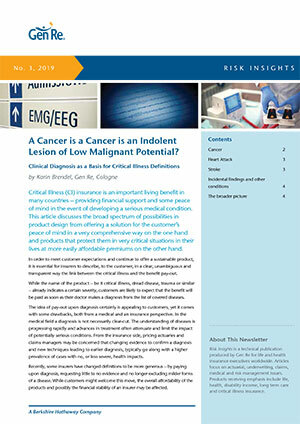 Increases in screening uptake, coupled with better technology, will thereby increase the diagnosis of early breast cancer and carcinoma-in-situ and this will be reflected at underwriting and claims stage in Critical Illness and Cancer products. 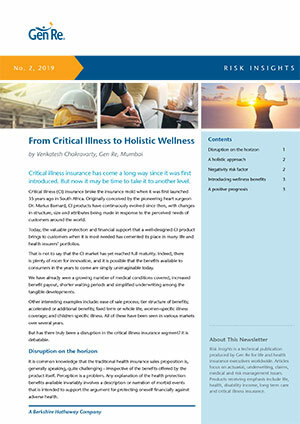 All of the above trends will have a significant impact on product development, pricing, underwriting and claims, particularly around Cancer and Critical Illness products in Asia.